Ben Flajnik is a Sonoma winemaker who suffered through a miserable season of ABC’s ‘The Bachelor.’ After being rejected by Ashley Hebert in last year’s finale of ‘The Bachelorette,’ he was the lead on this year’s program and found himself allured by the model Courtney Robertson, who seemed to be “in it to win it” at all costs. After the show’s airing, Flajnik appeared stressed and his engagement to Robertson on the ropes. Not surprising since Robertson, who appears to have high aspirations for herself, seems unsuited for a life in Sonoma wine country. I am sure Flajnik can’t wait to leave the limelight and return to Sonoma where he was born and raised. 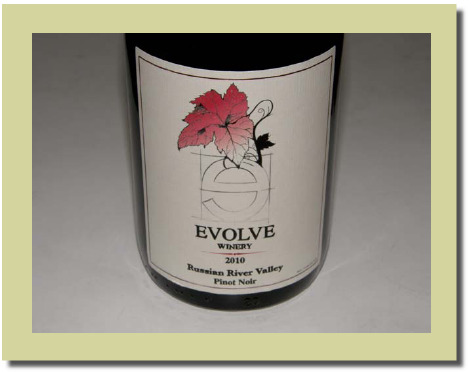 He launched Evolve Winery in 2008 with a boyhood friend, Mike Benziger of Glen Ellen’s Benziger Family Winery. Another childhood friend, Danny Fay, finished his wine MBA in Bordeaux and joined the winery as a partner in July 2011. The winery’s name was recently change to Envolve. A second brand, Epilogue, was started to offer a line of low price point wines. The partners are engaged in natural farming with the aim of achieving organic and biodynamic goals. I am not a fan of ‘The Bachelor’ show, but had some interest because Flajnik’s winery crafted a Russian River Valley Pinot Noir from Lennox Vineyard, and I was curious to sample it. The wine turned out to be quite good. I also sampled the 2010 Envolve Carneros Chardonnay which is solid and the 2010 Epilogue North Coast Chardonnay which is a good value. 14.4% alc., pH 3.66, TA 0.58, 218 cases, $29.99. From a 9-acre vineyard on the southern edge of the Russian River Valley. Dijon clones 115, 667 and 777. · Moderately dark reddish-purple color in the glass. Nicely perfumed with aromas of dark cherries and berries and Herbs de Province. Middleweight core of savory, dark red cherries and berries with a citrus imbued cranberry note on the bright finish. The wine has a herbal vein running through, avoiding the lush fruit-driven character of many Russian River Valley Pinot Noirs. Pleasingly viscous on the palate with a moderate tannic backbone. Considerably better the following day from a previously opened and re-corked bottle with improved fruit to savory balance. Very good.